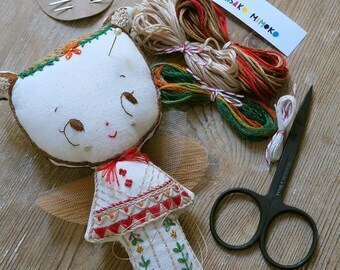 DIY Embroidered Doll Kit + Book. Waldorf Chestnut doll. Beginners Needlecraft Stitchery kit. Embroidery Fairy Doll Pattern & tutorial Gift. DIY Embroidery Kit + Signed Book. Starter Needlecraft project. Stitchery Kit for beginners. Hand Embroidery activity, pattern + tutorial. Sewing needle case. Teapot. Embroidery needle holder. 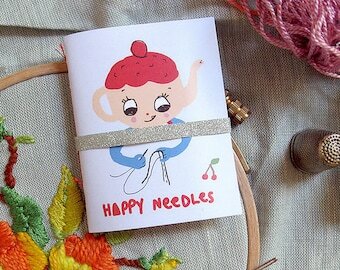 Retro Needle Book. Sewing kit. Travel needle case. Gift for sewer. Needle organizer. On SALE! Mermaid paper doll. DIY cut out paper puppet featuring doli little mermaid. Moveable paper doll. Holiday DIY Craft Paper Cutout. On SALE! Lime Lemon paper doll. DIY cut out paper puppet. Anthropomorphic Moveable paper doll. DIY Paper Craft. Cut-out. Home decor. Paper dolls. ON SALE! Set of 2 Art Paper Dolls. DIY cut out paper puppet. Articulated paper dolls. Retro Craft Assemblage Project. On SALE! Green Apple Cutout Paper Doll. Articulated paper puppet. Paper Doll ornament. DIY Craft Paper Cutout collectibles. Stationery. On Sale! Cutout Paper Doll. dolo strongman, articulated paper puppet. 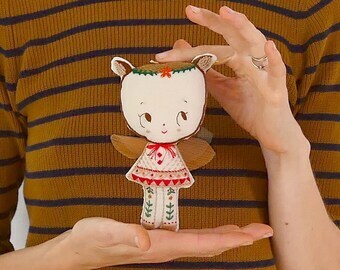 Paper Doll ornament. Holiday DIY Craft Paper Cutout. Stationery. On Sale! Croissant. DIY Paper Puppet. dolo croissant, cut out paper doll. Articulated paper doll. Stationery. Retro Home Decor. On SALE! Pineapple Paper Doll. DIY Paper Puppet. Cut out paper doll. Articulated paper doll. Stationery. Retro Home Decor. On SALE! Blackberry Paper Doll. Articulated paper doll. DIY cut out moveable paper puppet. Retro Collectibles. Fruit Paper doll. Sewing needle case. Poodle. Embroidery needle holder. Retro Needle Book. Sewing kit. Travel needle case. Gift for sewer. Needle organizer. Doli Almond. Almond doll. One-of-a-kind Art doll. 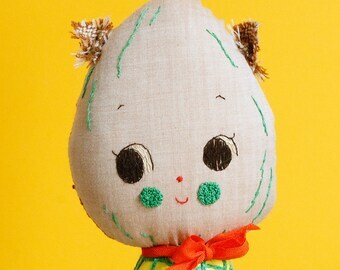 Handmade Nut doll. Anthropomorphic Rag doll. Vegan doll with yellow dress and orange bow. 3 Hugger Dolls. Pixie Elves Christmas ornaments. Pixie elf. Paper Doll Cutouts for Display. Holiday Elf Assemblage Project. Hugging Elf. Pear Doll. One-of-a-kind handmade rag doll. Fruit doll. 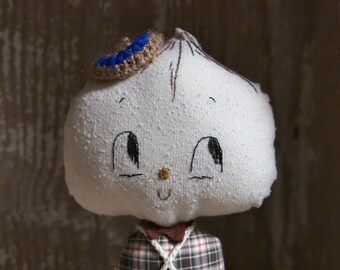 Pear art doll. Anthropomorphic Rag doll. Soft sculpture. Sit doll. Apple doll. Art sit doll. Apple doll. One-of-a-kind handmade rag doll. Fruit doll. Apple art doll. Anthropomorphic Rag doll. Soft sculpture. Sit doll. Embrodery workshop / Love tea parties, picnics and embroidering with friends at the park! Making dolls, embroidering, gardering, eating, dreaming... and drinking tea. Hello! I'm an artist that lives, works, eats and dreams in the beautiful city of Barcelona. I started making dolls and working with fabrics while studying Fine Arts, now i return to my old liking and i spend a lot of time putting colors together, playing amongst fabrics, sewing, crocheting... I'm completely fallen for vintage toys, children's books, 40s and 50s illustration, Japanese culture and naïve art. My rag dolls were included in "Indie Craft" a book by Jo Waterhouse, Laurence King Publishing October 2010. I'm also arranging craft workshops since the last four years, mostly about embroidery and doll making at nice places like Duduá and La Galeria. Thanks for taking a while and look around over my shop! Hope you'll enjoy it! You can find more information about my work, inspirations and products in the Profile section of the right menu. Please take a moment to review my Shop Policies. If you have any questions please send me an email and i'll get back with you as soon as possible! Gracias por visitar mi tienda! si tenéis alguna duda podéis contactar conmigo enviándome un email o a través de las conversaciones de Etsy. Si teniu algun dubte podeu contactar amb mi enviant-me un email o mitjançant una conversa d'Etsy. Merci pour visiter ma petite boutique! je parle aussi français donc n'hésitez pas me contacter si vous avez quelque question par émail où à les conversations d'Etsy. I may not be able to offer an exchange on any one-of-a-kind handmade items. I hope it never happen, but if you've change your mind and you don't love your purchase, please notify me within 7 days upon receive of package. You'll bear the costs for shipping, I refund you the total price minus the shipping cost. Please note that items to be returned must be unused and in their original condition and package. Also, I cannot be responsible for items damaged or lost during shipping. I accept PAYPAL ONLY, but you DON'T NEED to have a PAYPAL ACCOUNT, just convo or email me telling that you don't have any Paypal account and I'll send you a money request for the total sale. You'll be able to pay using Paypal website with your credit card or an e-check and not being even registered on Papal. Remenber that if you pay with an e-check takes more time to clear. The payment is due within 24 hours of purchase, otherwise I reserve the right to cancel the order. Customs charges or taxes may be due when you rececive your order depending on your country. These charges are your responsibility. Please read additional information about international shipping below and contact me if you have questions! I ship only ONCE a week. Most of the times the FRIDAY following the receive of payment. All my prints are shipped by ORDINARY MAIL, but the rest of the orders are shipped via PRIORITY Mail International to all locations, that means that all the shipping is REGISTERED and you'll be able to follow the item by a tracking number that will be assigned to your package. Please see shipping charges on each listed item. International shippings usually take from 5 to 8 working days to arrive, but I can not give you an exact delivery date or promise that your package will arrive by a certain day, it depends on customs as well as the postal service of each country. International shippings outside usually take around 15 days to arrive, but I can not give you an exact delivery date or promise that your package will arrive by a certain day, it depends on customs as well as the postal service in each country. You will receive a confirmation email from me automatically via Etsy, with shipping details. This is your order confirmation. You will later receive and email from me via Paypal with your tracking number, when your order ships. You can make a special request in the comment section, so if your order is a gift tell it to me and I'll send it directly to another address. You'll have to add the new address and the message you want to include. I'll wrap and pack it in a beautiful gift box with a lovely greeting note. It will be a wonderful gift ♥ people will love it! Files come in PDF and ZIP format. If you have a special request please let me know before you pay on Paypal and i'll try to accomodate it to your needs :) Thank you! Buyer satisfaction it's really important for me, I will do my best to keep everyone happy. dolis y dolos by Eva Monleón is licensed under a Creative Commons Attribution-Noncommercial-No Derivative Works 3.0 Unported License. Copyrights do not transfer with purchase of a piece. I reserve all the right to post or use the photographs of any item that origines as a custom order. You may use my products for personal / Non-Profit use. Absolutely no collage sheets, digital papers, digital stickers etc or reselling as commercial use resources in any way. YOU MAY NOT share, resell, redistribute my original files, turn into brushes/tubes or shapes, create rubber stamps from the image, resell as clip art, offer as freebies, sell as digital collage sheets, or sell as layered templates of any kind. Please do not claim the graphics as your own, the copyright remains with me at all times. If you need these files for any usage not listed above, please contact me!